JADOPPT is a tool for automatically preparing and processing multiple AutoDock results, thus allowing their simultaneous analysis and comparison. 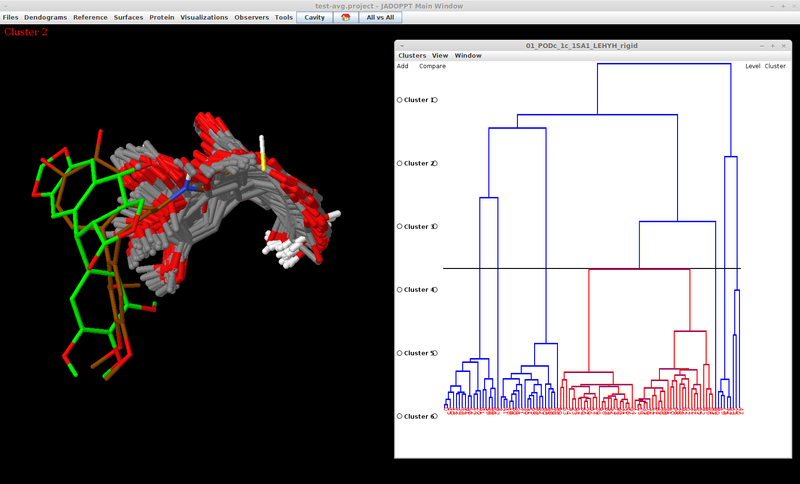 Selects representative poses from each docked molecule, compares and clusters them altogether. The poses are presented in an animated three dimensional molecular display linked to representations of the clustering results where clusters can be selected and navigated through. Additionally the structures of reference ligands can be included, thus facilitating structural analysis. The binding site residues, the reference ligands and the most favorable interaction regions can also be included in the display and relevant information such as the binding energy or the rankings of the selected poses can be presented in order to support decision-making. Finally, JADDOPT can be used to modify the AutoDock map files, thus allowing to refine the docking experiments. * García-Pérez, C., Peláez, R., Therón, R., & López-Pérez, J. L. (2016). JADOPPT: Java based AutoDock Preparing and Processing Tool. Bioinformatics, DOI:; 10.1093/bioinformatics/btw677.